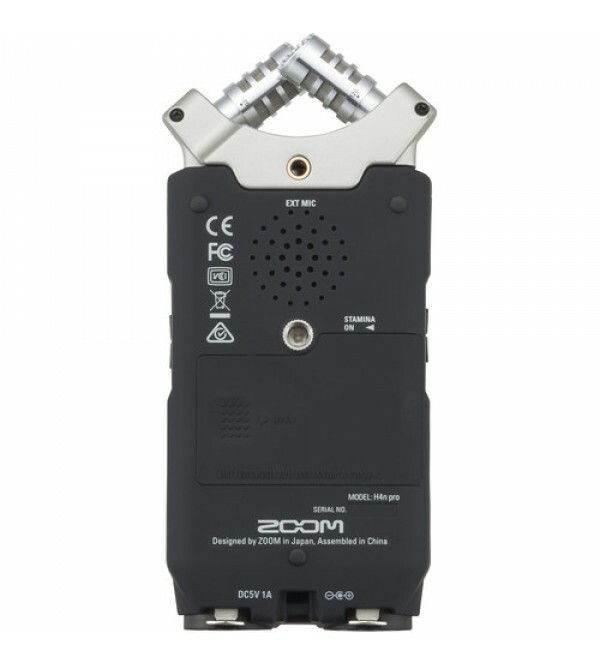 A portable recording device and a 2-channel USB interface in one palm-sized unit, the H4n Pro Handy Recorder from Zoom features a stereo X/Y microphone capable of handling 140 dB SPL, as well as two low-noise preamps with locking combination XLR / 1/4" inputs, multiple recording modes, on-board effects, a built-in metronome, a chromatic tuner, and more. As such, it's suitable not only for film-audio capture, podcasting, and field interviews, but for the creation and editing of multitracked audio in conjunction with DAWs. The on-board X/Y stereo microphone is capable of handling sound pressure levels of 140 dB. It can also cover a wide berth whilst capturing any sound source in its center with precision. Both microphones are angle-adjustable: You can change the angle of capture from 90° (for a focused stereo image) or 120° (for a wider stereo image) simply by twisting each mic's capsule. Revamped with the same low-noise preamps as the H5 and H6, the H4n Pro provides combination inputs for XLR or 1/4" connections, both balanced and unbalanced. As such, it can handle mic/line and instrument signals. 24 or 48V Phantom can be applied to both inputs. Additionally, a stereo 3.5mm line jack for external devices—lavalier microphones, for example—is included. This jack supplies 2.5V power, if need be. Utilizing its mini-USB port, you can use the H4n Pro as a 2-in/2-out interface for computers, recording straight to your DAW via its preamps and monitoring through the 3.5mm stereo headphone jack. Record in stereo mode, four-channel mode (utilizing the on-board stereo mics in addition to the built-in preamps), or in multitrack mode, which makes use of built-in effects, overdub functions, and the ability to work with prerecorded material. Additionally, you can use the pre-record function—ensuring you always capture audio starting from two seconds before the moment you press record—or the auto-record function, which allows the H4n Pro to start recording whenever it senses audio, and to stop as soon as the signal drops below a pre-set threshold. 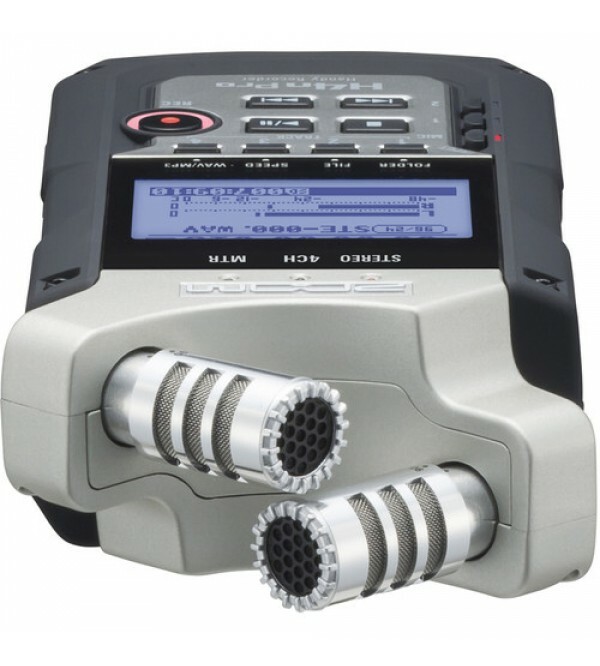 The H4n Pro offers a variety of effects, including compression, limiting, reverb, delay, echo, a low-cut filter, and more. You also get an on-board metronome and tuner, along with dozens of amp models and effects crafted for guitars and basses. 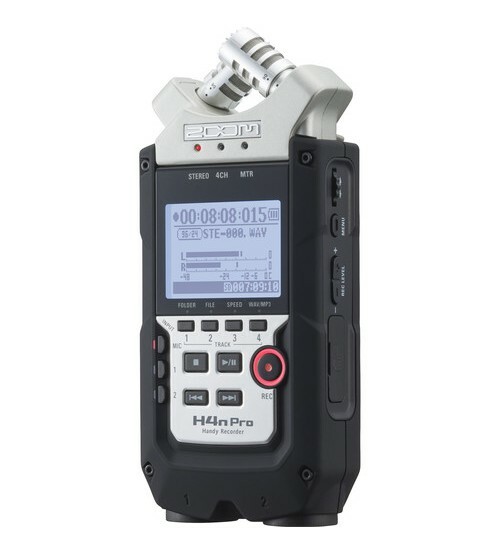 Furthermore, you can loop playback, adjusting the pitch and speed of the audio independently; this makes the H4n Pro a tool suitable for transcriptions, whether you need to get the words of a particularly fast talker down on paper, or the notes of a particularly fast guitar solo under your fingers. · Record up to 140 dB SPL with X/Y microphones. · Output/headphone jack with dedicated volume control. · Built-in reference speaker for fast playback. · Internal mix-down: Four-track to stereo and stereo to dual mono. · Up to 99 marks per recording. · Normalize (maximum gain) and Divide (file-splitting) functions. · Mounts to mic stand or tripod, or directly to DSLR with optional Hot Shoe adapter.